The following image appeared in The Economist magazine in early September, 2010, in association with the release of Stephen Hawkings' work The Grand Design (which was actually co-authored with another physicist named Leonard Mlodinow). 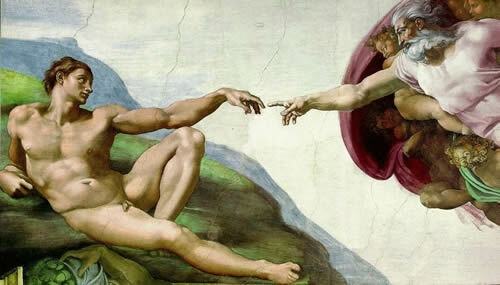 It is a "Scientific-Rationalist" parody of an original that appears on the ceiling of Rome's Cistine Chapel. Professor Stephen Hawking is one of the most famous physicists of recent times. 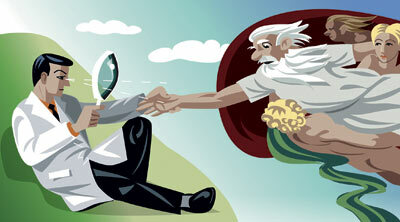 Modern physics leaves no place for God in the creation of the Universe, Stephen Hawking has concluded. 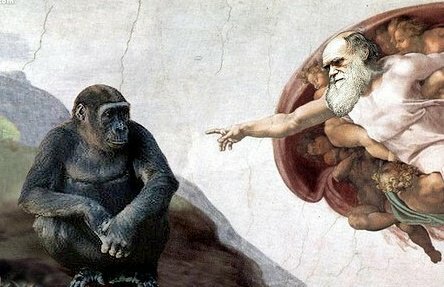 Just as Darwinism removed the need for a creator in the sphere of biology, Britain's most eminent scientist argues that a new series of theories have rendered redundant the role of a creator for the Universe. In his forthcoming book, an extract from which is published exclusively in Eureka, published today with The Times, Professor Hawking sets out to answer the question: "Did the Universe need a creator?" The answer he gives is a resounding "no". Far from being a once-in-a-million event that could only be accounted for by extraordinary serendipity or a divine hand, the Big Bang was an inevitable consequence of the laws of physics, Hawking says. There was widespread publicity about the new book in early September, 2010, with many print and on-line media outlets covering the story. There is no place for God in theories on the creation of the Universe, the physicist and mathematician Professor Stephen Hawking has said. He had previously argued that belief in a creator was not incompatible with science - but in a new book The Grand Design, he concludes that the Big Bang was an inevitable consequence of the laws of physics. "Because there are laws such as gravity, the universe can and will create itself from nothing. It is not necessary to invoke God to light the blue touch paper and set the Universe going." But! If readers have the time ~ also of interest perhaps? Metaphysics is a fascinating subject - all be it one that can variously challenge traditions of theism, and of atheism. An earlier and quite famous work by Stephen Hawking - A Brief History of Time - contains several revealing quotes on God and Religion. "However, if we discover a complete theory, it should in time be understandable by everyone, not just by a few scientists. Then we shall all, philosophers, scientists and just ordinary people, be able to take part in the discussion of the question of why it is that we and the universe exist. If we find the answer to that, it would be the ultimate triumph of human reason -- for then we should know the mind of God." 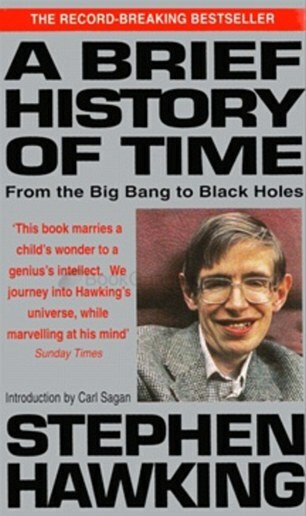 In a later work Black Holes and Baby Universes and other Essays Stephen Hawking revealed that A Brief History of Time remained on the bestseller list of The New York Times for fifty-three weeks, that as of February 1993 it had been on The Sunday Times best seller list for 205 weeks, and that translations into 33 languages other than English had already been published. Also in Black Holes and Baby Universes, Hawking goes so far as to attribute a marked increase in sales to this - discovery of a complete theory of everything means knowing the mind of God - quotation which was probably from his point a view nothing more than a metaphor indicative of an understanding of the universe which was complete and objective. "In the proof stage I nearly cut the last sentence in the book... Had I done so, the sales might have been halved." As sales of A Brief History of Time currently stand at over nine million copies Prof. Stephen decision not to edit out that sentence may have had notable consequences! Stephen Hawking, alongside holding skeptical views on God and Religion, is also deeply skeptical about the value of Philosophy!!! He even goes so far in 'The Grand Design' as to suggest that "Philosophy is Dead". At Age-of-the-Sage we see relevance in God, Religion and Philosophy!!! It is widely known that Plato, pupil of and close friend to Socrates, accepted that Human Beings have a " Tripartite Soul " where the individual Human Psyche is noticeably composed of three aspects - Wisdom-Rationality, Spirited-Will and Appetite-Desire. that give convincing support to such a view of Human Nature!!! Believe it or not even Modern Psychological Science seems to agree with such a view!!! Metaphysical Human Nature versus 'Darwinist?' physical evolutionism. "What I have done is to show that it is possible for the way the universe began to be determined by the laws of science. In that case, it would not be necessary to appeal to God to decide how the universe began. This doesn't prove that there is no God, only that God is not necessary." In October 2001 an article appeared in the London-based Telegraph newspaper wherein Prof. Hawking was represented as being interviewed "about life, the universe and everything". You use God as a metaphor for the laws of nature but, from what I remember, you are not religious in any way. Is this still the case? And Prof. Hawkings reply was:- "If you believe in science, like I do, you believe that there are certain laws that are always obeyed. If you like, you can say the laws are the work of God, but that is more a definition of God than a proof of his existence." In June of 2010 Channel 4 aired a series themed as "Genius of Britain" where, according to Stephen Hawking, several British figures prominent in scientific fields sought "to tell the stories of the British scientists who changed the world, and to put science back on the map." 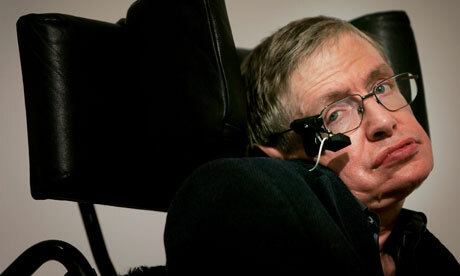 During the recording of this series Professor Hawking was asked whether he thought God existed. "The question is: is the way the universe began chosen by God for reasons we can't understand, or was it determined by a law of science? I believe the second. If you like, you can call the laws of science 'God', but it wouldn't be a personal God that you could meet, and ask questions."